Want to know more about Spanish literature? 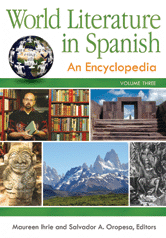 Take a look at World Literature in Spanish: An Encyclopedia (ABC CLIO 2011) in our Credo Reference collection of online books. In addition to brief biographies of authors, you'll find thematic articles on many literary subjects: autobiography, the avant-garde, children's literature, exile writing, feminism, imperialism, journals, the novel, short fiction, and the history, culture, and literature of the Spanish-speaking countries. Credo Reference Online provides access to this and many other reference works about literature.